People board their pets for many reasons. Why do you? A houseful of out-of-town visitors (who may not be pet lovers)? Ralph doesn't like being alone during the day? New baby in the house? Send us an email and let us know your unique reason for boarding your cat or dog, even if it's with someone else (we'll forgive you). THERE IS A BIG DIFFERENCE BETWEEN BOARDING AND BORING. 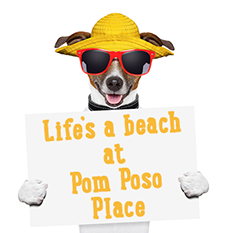 While at Pom Poso Place, your pet is never bored. At Pom Poso Place, your dogs and cats are treated like family. Each will receive a customized boarding experience. Our experienced and loving staff will shower them with daily love and attention. We live on-site. There is never a delay if your pet needs attention. Come to us for the best care at the most affordable rates in Southeast Idaho. Does your pet require a special diet, or need a little extra TLC at night? No problem! We believe in caring for each pet individually and will happily create a personalized guest experience that accommodates their special needs and your requests. Once your pet stays with us, they become part of the Pom Poso Place family. Our kind and loving staff is fully committed to your pet’s safety, comfort, overall health and well-being. It’s our privilege and honour to care to care for your furry friends, and we value the trust your place in us. Grooming available before you pick-up your pet. 4’ x 8’ indoor/outdoor runs - $18/night for the first dog, $6.00/night for second dog and $3.00/night for each additional dog sharing the same run. 6’ x 8’ indoor/outdoor runs- $29/night for 1 -2 dogs and $3.00 for each additional dog sharing the same run. We reserve the right to limit the number of dogs occupying the same kennel.